From Cairo, on the road to Gaza. While a short article made it into the NY Times today, the story of the more than 1,000 peace activists who are trying to enter Gaza is still a story mainly untold. Bernardine Dohrn sends the following post from Cairo, Egypt. It has been a tumultuous 15 hours. Two buses, carrying 100 people from the GFM and loads of humanitarian supplies just departed from Cairo for Gaza. This was a victory and a concession. The decisions and the manner in which this opportunity was framed and promoted by various actors fractured the GFM participants in familiar and unlikely, real and sectarian ways – all documented by media cameras and hundreds of Egyptian security forces. Ali Abunimah, Bernardine Dohrn, Veterans for Peace organizers, and Israeli journalist Amira Hess were among the 100 people on the list to go, who arrived at 6:30 this morning, on the corner of Ramsis by the 6thOctober Bridge at the Al Gona Bridge, to depart for Gaza. 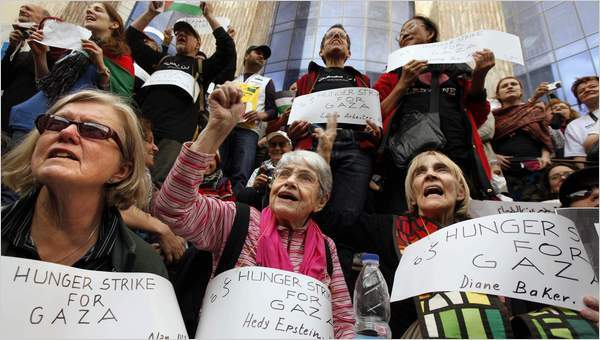 Tuesday morning, delegates from several countries went to their embassies in Cairo to plead for help getting to Gaza. Most were met with predictable bureaucratic intransigence. The French, however, staged an extraordinary encampment in front of their embassy and their ambassador and his wife came out and spent time speaking with them individually and in small groups. That action continues today. Bill and I went to the American Embassy at 10 am and asked to see the Ambassador. We were ushered into a holding pen a block away from the embassy building where we joined 35 people already there, surrounded by Egyptian soldiers. Over the next 4 hours, another dozen Americans arrived, and those of us who asked to leave, were denied. Meanwhile, Medea Benjamin, Kit Kiteredge, and Ali Abunimah were meeting with an embassy official and stressing that we intended to go to Gaza on a non-violent, humanitarian mission, and requesting their assistance. Further, they asked that the embassy officials release the US citizens who were now clearly being detained outside. Ali emerged first, to tell us that their discussion achieved nothing, and they were now requesting that we be free to go. This process took another hour. Ali refused to enter the holding cage, and spoke to us from outside. At one point, out of nowhere, military personnel grabbed Ali, and Medea – who was standing a few feet away – sprang to action, shouting “No! No!”, grabbing Ali’s arm and pulling him down to the ground with her. As soon as they were prone, the security backed off. It was an impressive display of non-violent direct action and solidarity in-the-moment, performed with speed, force and clarity. In late afternoon, a huge demonstration took place outside the Syndicate of Journalists, a traditional site of political mobilizations in downtown Cairo. The GFM was a force, and joined by large numbers of Egyptian citizens chanting in solidarity with Palestine and in opposition to the visit that day by Netanyahu. This action got widespread coverage throughout the Arab world. As we stood in the morning chill of the stunningly polluted Cairo sky, those boarding the buses felt that it was a partial victory to have two busloads depart for Gaza, that we would take supplies, and witness the realities of life under the occupation/blockade. We thought that our primary objective was to break the isolation of Gaza, and to join with the civil society forces there who wanted us to come join them. The GFM forces opposed to the compromise that left 1300 of the GFM still in Cairo, gathered at the departure point and began painting banners and chanting against the departure of the buses. Egyptian security grew. We boarded the buses, loaded supplies, handed over our passports and sat on the buses, excited and exhausted, watching the opposition to our departure gather steam. Signs were hoisted, some began shouting and crying, and chants to Don’t Go, Get off the Bus, and All of Us or Nonegrew in force. Many, unhappy to have worked so hard to get here and who built critical support for Palestinian solidarity and human rights, felt that it was unfair to be left behind, and not to have been consulted. People wavered. Resentment and criticism of leadership (legitimate and small-minded) and the obvious manipulation of the situation by the Egyptian (+ Israeli and US) governments escalated. Al Jazzira ran a story quoting the Egyptian Prime Minister who proclaimed that only the reliable and respectable people had been selected to travel to Gaza (! ), leaving behind the rabble rousers and unruly GFM marchers, and claiming credit for delivering the humanitarian supplies to the people of Gaza. It was clear to us in the hours of debate and delay that some would leave for Gaza, and that others would stay in Cairo to press the demand that the border be opened, the blockade ended, and that all of the GFM participants be allowed to enter Gaza. One of the great difficulties throughout these several days has been to keep ourselves and all participants focused on Gaza. We find ourselves unwillingly in Cairo, drawn into clashes with authorities and one another on side issues, when what we most want it to keep our eyes on the Palestinian people and our spirits with those confined in Gaza. This is the challenge of the next three days. A large group of us is planning to try to walk to Gaza starting tomorrow, December 31. Buses and taxis containing smaller groups have been turned back all week, and the situation remains fluid, dynamic, and fraught. PreviousTeacher union push back on Race to the Top. Two states now say no. How many more?